Boskel Incinerator technology was originally developed in 1995 and has matured ever since. 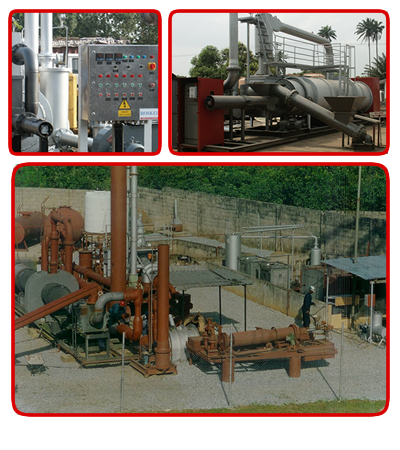 Several Incinerator units based on Boskel technology have been designed, built, and installed. Boskel Incinerators are designed for cost effectiveness while maintaining the strictest standards for effluent gas emission. Boskel also operates and manages it's own hazardous and industrial wastes facility to showcase Boskel Incinerator technology. Boskel Incinerators are designed for waste liquids and solids (municipal & industrial), and can handle hazardous wastes as well. The capacities of our incinerators for solid wastes range from a few tonnes to 100 tonnes per day. The Liquid Incinerators range from 5L/min to 25L/min. All Boskel Incinerators comply with the strictest standards for effluent gas emission and our Incinerators are equipped with Flue Gas Scrubbers that efficiently remove pollutants and dust from the flue gases. We also have Emission Control & Monitoring Units (ECMU) that report vital statistics on emissions. Boskel Incinerators are based on a Rotary Kiln design for full thermal treatment/decomposition of hazardous, industrial and municipal (solid and liquid) wastes. Wastes are fed into the kiln via a screw conveyor into the kiln where the operating temperature is between 500-1100 C and the operating pressure is slightly below atmospheric. The residence time, which is also the expected time required to achieve thermal decomposition in our kiln, is usually 45 minutes or less and can be adjusted if necessary as may be determined by pre-treatment tests carried out on waste samples. Effluents discharge below regulatory levels. Destruction and Removal efficiencies of 99.99% and far beyond for POHC (Principal Organic Hazardous Compounds) including PCB (Polychlorinated Biphenyls). Spares and Maintenance readily available. Totally Nigerian in Design and Fabrication. Technological appropriateness to the African environment while maintaining high (International) quality standards in effluent discharge and operability. Industrial Waste Incinerator for Halden Nig. Ltd. Integrated Wastes Management Facility, Asaba, Delta State.